Herself wanted to pick up a few things in Ballina so we drove up there yesterday. For those who don’t know this area Ballina is a bustling little town on the River Moy and the famous Ridge pool is right in the middle of the town only a few yards from the main street.Helen went off to do her bits and I took a wander down to the river to see what was happening there now the season is over. 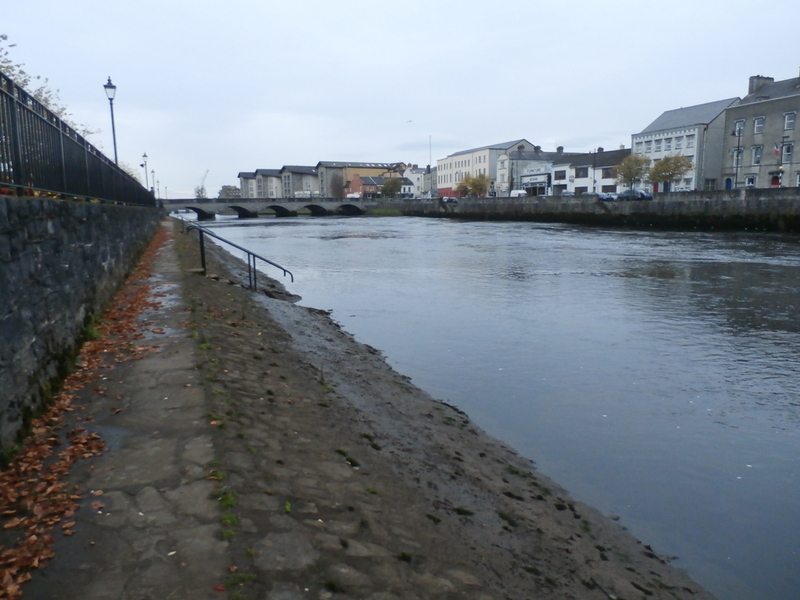 With no rain to speak of recently the Moy was low. During a spate the river rumbles impressively under the bridges but in low water it loses much of its splendour. On an overcast day like Saturday with the hum of activity from the local shops and businesses the river felt almost forgotten, the casting and wading over for another year and the the waters looking lonely,empty and cold. Some tiny fry were jumping in the shallows as I scanned the cathedral beat for signs of life. The Cathedral Beat is immediately below the Ridge Pool and is a nice piece of water in terms of flow and structure but it is very busy so I don’t bother fishing it (I like a bit of elbow room when wielding a fly rod). A heavy swirl well below where I was standing caught my eye so I moved down river to see what had caused the commotion. It looked to be too big a disturbance to be a salmon and sure enough a head appeared some 30 yards from me in the current – a seal. These lads often chase the salmon up the river as far as the Ridge pool and they can do a lot of damage in the confined spaces of a river. Nothing can be done about this, as culling seals is not an option. Large numbers of seals live in the Moy estuary and can be seen sunning themselves on sandbanks further down river. I watched as he swam up to the bridge before he disappeared from view. I checked the time – I had to go and meet herself. Like the seal, I was due to get a bite to eat.